USA Today bestselling author Dean Wesley Smith returns to his fan-favorite Seeders Universe series with a third novel, Morning Song. 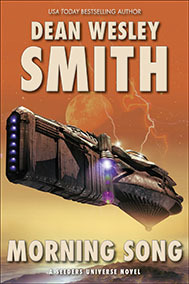 A massive ship powers toward the Milky Way Galaxy, threatening to destroy entire worlds. The rogue ship, the size of a moon, seems to have no entrance. With little time before millions die, Maria Boone and Roscoe Mundy must somehow take a small team into the massive ship to stop it. A galaxy-spanning tale of adventure and suspense and the humanity that can exist in a vast culture.